Seriously District Court. You must be kidding. My birdies are home for a few more days and you want me to appear in court. These were my thoughts when I got my Jury Summons. I quickly flipped the card over and zoomed in on the exemptions. I scrutinized each possibility for my exit strategy. I’m not over 70 but if the ‘Time Thief’ I talked about in my last post doesn’t slow down, I will be before I know it. I wouldn’t be an empty nester if I still had a child under 12. I lost this exemption when the form wasn’t altered to say 12 instead of 15. They must have bulk ordered the forms. It’s been a long time since I was a high school student, although, when my children were in high school I think I was at the school more than many of their less ambitious classmates. I was a ‘helpful’ parent. ‘Helpful’ parent sounds so much nicer than ‘helicopter’ parent. I was attending college last semester. It was a Continuing Education class that met one night a week and I didn’t get a grade. 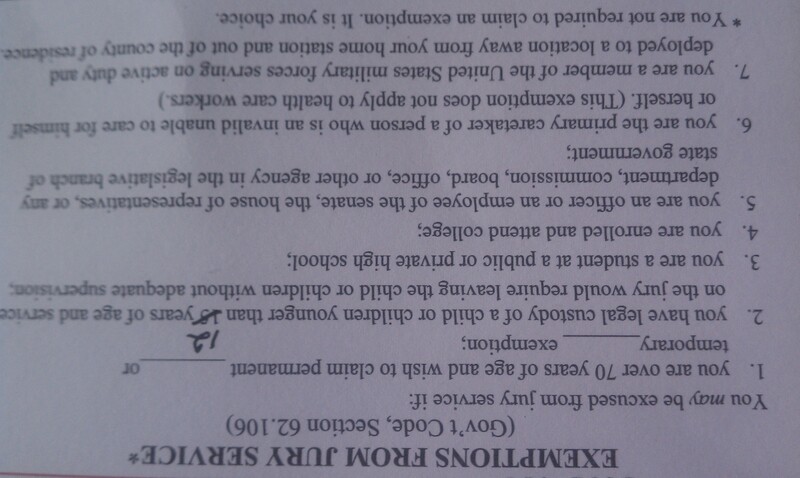 Not exactly what the court system had in mind with this exemption but I gave it some thought. I could quickly enroll in another class. That felt like cheating and a little extreme. Alas, my overactive conscious (I curse that right-minded Cricket of childhood) kept me from calling the local Junior College. I don’t work for the legislative branch of the government. No exemption there. If I worked for the government there would be an exemption for empty nesters with children home for the holidays. I’m not a primary caretaker for an invalid although I am a caretaker for people who, at times, act like invalids. I’m a little bitter about taking out the trash even when I have able-body children home. I’m not in the military but I raised three teenagers so I’m familiar with domestic battle zones. Have you heard of the Smith family trash wars? Where was the exemption for empty nesters? I expected to read, ‘You may be excused from jury service if you are suffering from temporary NENS or Non-Empty Nest Syndrome. It wasn’t there. The following Monday I reported for jury duty. For three hours I sat on the front row feeling sorry for myself. I knew I would get chosen. I’ve been summoned, without a valid exemption, five times and I have served four times. The one time I didn’t serve, I was number 222 so the odds were good they wouldn’t pick me. They need twelve jurors and the two lawyers only get ten strikes each. On this Monday I was one of the first twelve when they seated us numerically. When the lawyers were ready to announce their selections, I picked up my book. I read little of my book during my hours at court because I was thinking about the time I was going to miss from my children while I served on the jury. I pulled my purse out from under the bench so I would be ready to make the move over to the jury box. I made sure the lid was tight on the water bottle hidden in my purse. Frequently called jurors learn that judges and lawyers spend lots of time doing lots of things that don’t involve the jury pool. You need a good book and a water bottle. The first name the judge called was someone sitting behind me. That was strange. They usually call in numerical order, but still, I didn’t doubt my fate. It wasn’t until twelve people took their seats in the jury box that it sunk in. I was off the hook. I almost let out a shout of joy. I was heading home and college girl was probably just waking up. As I headed for the door, high-fiving the other freed candidates, it hit me. I hadn’t been picked. How could that be? I didn’t say anything controversial. I didn’t really say anything at all. What did the lawyers read into the general information on my juror card? What made those other candidates better than me? What’s wrong with me? My feelings were a little hurt. It was shocking how some people lie to get out of jury duty though. Humanity rocks, right? No kidding. I hope to never get picked again. Thanks for the good laugh this morning! I have been called three times for jury duty. Once, I was in Europe, the next time I was having a baby (delivery counts, I guess), and the latest happened to be a horrible snowstorm so it was cancelled. I am afraid I won’t get lucky if I am called for a fourth time so I will take your advice and bring my book and a bottled water! I think everyone should serve once but I found once to be enough. Unfortunately the court system did not agree. Being in a totally different situation than you, I actually don’t mind jury duty. Courthouse is a fifteen minute walk from me, so it’s a shorter commute. That said, glad it didn’t cut into your family time! I don’t dislike the decision of guilty vs. not guilty as much as I dislike the sentencing. I personally can add hours to the process. People whisper about me as we leave. Thanks for reading. Four times? Ghee you wouldn’t win the lotto as quick! Good you got your wish. I guess I just look like someone with nothing else to do. My true wish is to never be called up again. That was really a lucky break, but of course you would still wonder why you weren’t selected! I can’t believe you’ve served 4 times. Great line about “domestic battle zones!” Glad you were able to spend more time with your daughter. Me too. She’s gone now and the house is quiet. It’ll take a few days to get used to that again. Great, great .Loved the approach. Having been there recently, I appreciate that dawning moment when you realize you’ve made it! I have experienced it enough to know it is not where I want to be. My mom loved Perry Mason. I watched it frequently. Nothing like reality. Jury Duty is painful in reality. I was only called once for Jury Duty, and I was picked. It was a malpractice case. Watching 17 years of Law & Order never prepared me for the depth of the boredom. Well, if so, I’ll be sure to have a water bottle and a good book. Everytime I call the recording I hope to hear that we’re dismissed. It’s never happened to me. Thank goodness…Surely there are enough folks out there who would volunteer for jury duty that they don’t need to conscript the unwilling. You are exactly right. Everytime I go, a few people are excited to be there. I think they should have the chance to serve. I really enjoyed reading this – too funny. Sidenote: The american jury-sythem has always intruiged me b/c it is not at all part of our German judicial systhem (well it is to a very slight degree, but that would make for a long post explaining it, so for all facts and matters it’s basically non-existent). I always wondered – would judgement by your peers be more or less legally right? In the course of my specilisation I took a lot of american (thus common -) law classes and the differences to the civil law I was raised with is so fundemental, it’s mind boggling at times – and yet we fall back on same / similar legal fundamentals. Thank you for sharing. The legal system is intriguing to me but everytime I come up against it, I find it baffling. Thanks for reading. I was so jaded by the experience that I sound like a raving lunatic whenever I’m up for the selection process, hence, I haven’t been selected again. I sort of sound like that here. I’m glad you were not selected! Six weeks. You should be jaded. I’ve never served more than a couple of days and that drained me for a few days after the experience. I’m sure I could convince a judge to disqualify me on these grounds. I would just tell him to read my blog! I love the “Non-Empty Nest” excuse! Most of my daughter’s friends had headed back to school and I was excited about some one on one time. 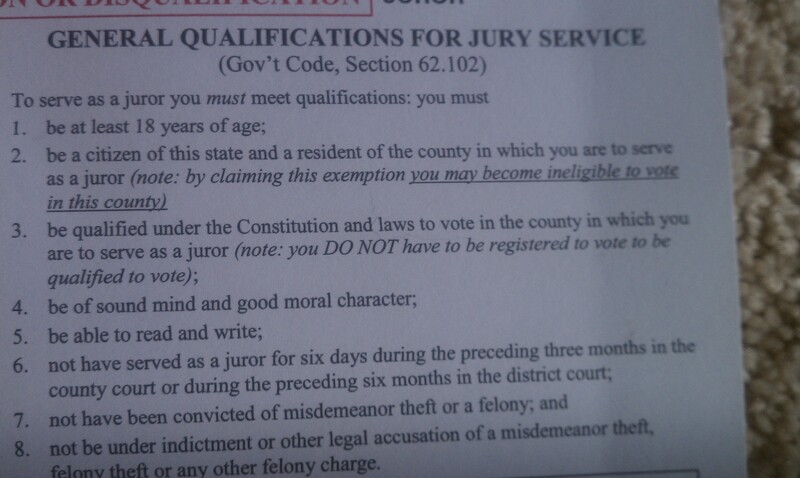 I guess I took the jury duty a little personal. Though I guess i’m in the minority, I love jury duty. So nice to be on the right side of the courtroom. For some reason I never get picked…Congrats on the pardon! I cut out a paragraph on why I hate jury duty. I’ll post that one day. There are times it is clear cut but it’s those other cases that make it hard.